Stationery. My guilty pleasure, and so it is for many bloggers and organisation enthusiasts like me. I'm new to being an organisation enthusiast but not having my life and things in order really bugs me these days and it's one of those recently developed traits that I know can be annoying but I'm glad to have developed. Am I making sense? I hope so. For the millionth time mentioned on my blog, the year ahead is creeping up quite quickly now, and I really want to have some lovely stationery to start my final year at uni. I feel like new stationery is a great way to start a fresh and begin a new life chapter motivated and ready to go. What a great excuse for some stationery shopping! Amiright!? I love a good notebook, so of course there's lots here including one of those amazing agendas by Bando! I really want one and I'm waiting for the UK stockists to get them so I can get my hands on one for the coming year! I also really love the Kate Spade notebook in yellow and that Bloggers Journal by Paperchase! Cute no? Other cute things on my wishlist are those gold scissors. Need I say more than gold? I know they're a simple thing but when one makes simple and essential stationery things cute, you can't help yourself. I have a sharpener that is in the shape of a bunny and the teeth chomp down when you sharpen pencils... And though I probably don't need another pencil case, this one with the animals on is just too adorable to say no to. I'll be doing a stationery haul in the near future I think. Pens... notebooks... ALL the things. I love all of these, especially the Kate Spade journal and the pencil case! Oh no! 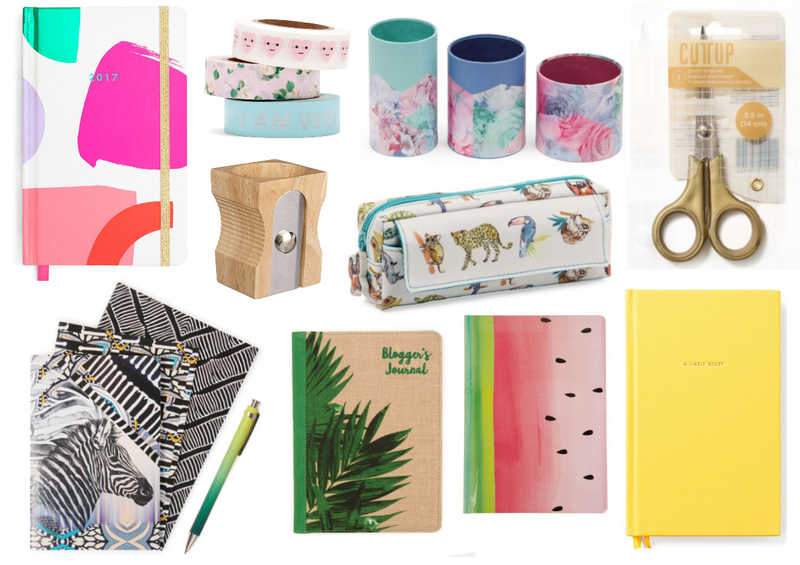 I'm such a sucker for stationery and you have such good taste I can feel a shopping trip on the horizon!